A 2015 survey by the National Association of Colleges and Employers confirms the importance of these skills. Yet it seems that young people are often not masters of these skills when they graduate high school. How can we ensure that high school graduates are highly proficient in these key career skills? 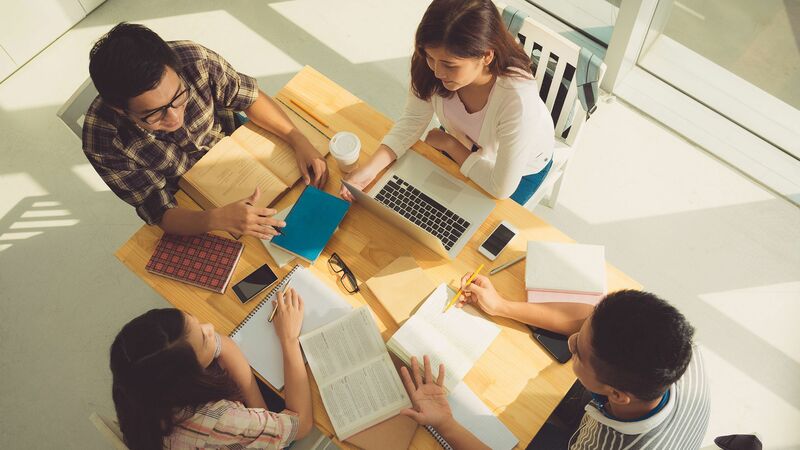 Collaboration, communication, and critical thinking, sometimes called the three Cs, can be fostered in K–12 environments: Students already work in teams, give presentations, write papers, and solve complex challenges. Innovations in teaching and learning—including STEM/STEAM, project-based learning, inquiry-based learning, and design thinking—also enhance these skills. And traditional education includes opportunities for Socratic seminars, labs, literary analysis, and studying complex mathematical formulas and scientific hypotheses. Teachers provide these experiences in school, but colleges and business people continue to say that young people lack a grounding in the three Cs. The reason for this puzzling disconnect is best expressed by students. I’ve interviewed many students across the U.S. in all kinds of schools, asking them to define and describe communication, collaboration, and problem solving. In classrooms where good collaboration took place, students would say that people were positive and did their work. But they could not describe the behaviors they demonstrated that could be replicated each time they worked in teams. The same vague responses were shared regarding good communication and problem solving experiences. There were some students who could give clear definitions and provide concrete examples of their practice. Their classrooms and schools shared common practices, described below, so that students understood the three Cs as well as they did the rest of the curriculum. Listens to others, fully present to others’ meaning. Seeks to understand before being understood. Encourages through verbal and nonverbal cues. Expresses ideas and questions in clear and concise language. Uses pitch and tone to express thoughts in an appropriate manner. Is mindful of communication skills when having difficult conversations. Sometimes teachers or staff develop the first draft of the behaviors. Then students propose revisions in language that makes sense to them. The resulting description charts are best posted on all walls so that they can be seen and used by everyone. Introduce one chart per skill, and gradually add the other Cs during the year. Being intentional is key to learner growth (see my new book, So All Can Learn: A Practical Guide to Differentiation). Use your charts to dialog with students about their work. For example, chemistry teacher George Hutcheson would move between student teams to monitor their progress on a project-based learning experience. He redirected students toward the assignment when needed by having them reflect on their collaboration. He also gathered project leaders from each team to discuss their responsibility to keep everyone on task and contributing—both of which are collaboration skills. Students need opportunities to reflect on their use of the three Cs. For example, Jennifer Dyer, a French teacher, would start a lesson by having students work with partners to reflect on and discuss the behaviors from their chart that they felt were important to the work. At the end of a lesson, the students evaluated their success with the skills in completing the work. Use reflection before and after activities that require students to practice the three Cs, such as after protocols. Five minutes in total for reflection is time well spent. Leadership comprises the three Cs and is exhibited through being a participating citizen. Becoming an active citizen requires thoughtful practice of the Cs in connection with involvement in communities both local and farther afield. A great example of teachers and students growing a culture of deeper learning through 21st-century skills is Isle of Wight County Schools in Virginia. Check their twitter hashtag, #IC5Cs, for a wealth of shared practices and experiences. Being intentional with developing 21st-century skills is the only way that students consciously grow the skills. Imagine a class of students who develop a deep understanding of these four Cs from kindergarten to third grade. Now picture them as high school seniors after more years of practice. These amazing citizens could transform expectations in college and the workplace.